DERMagic is all about natural skincare for animals that are suffering from horrible skin issues and itching. If your dog has skin problems, like inflamed oozing hot spots, minor wounds, insect bites, localized allergic reactions, and itchy or inflamed areas, then turn to this salve for relief. 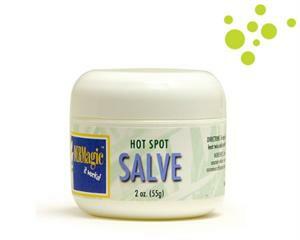 Dab on a small amount of DERMagic Hot Spot Salve topically once or twice per day until symptoms disappear. Always keep DERMagic handy for those small bites or cuts to prevent infection. It is suggested to cut down the hair surrounding the wound site and then apply the salve. Additionally, the site should be covered, so you may need to put a t-shirt on the dog or sock if the paw is affected.